This is arguably the most important new book on Mormonism in half a century, since Fawn Brodie's landmark biography of Joseph Smith, No Man Knows My History (1945). Quinn's subject is the evolution and function of the Mormon ecclesiastical and theocratic hierarchy during the lifetime of its founder Joseph Smith (1805-1844), through the transfer to Utah in 1847 following his assassination. (A second volume due out in 1996 will carry the story down to the present.) Although not as overtly damaging as Brodie's work, it will be harder for Mormons to dismiss this book's deeply disturbing implications because of its more dispassionate style. "Mormon historians have tended to avoid this evidence because it means the church was organized without proper priesthood authority. This evidence will be haunting for thoughtful Mormons who take official church teaching seriously." 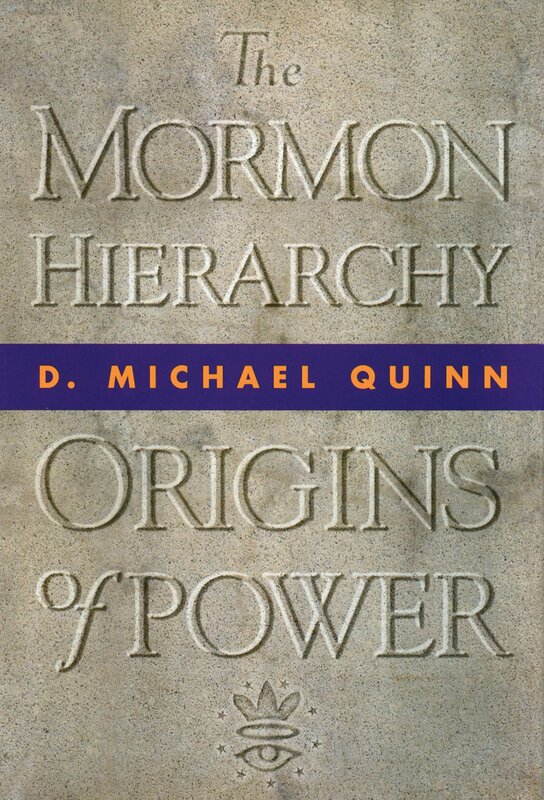 The book's author, D. Michael Quinn, is a deeply pious, 1 seventh-generation Mormon and former Brigham Young University history professor. He is hailed by his peers as a consummate scholar whose work reflects boundless energy and painstaking attention to detail (the book's 1296 endnotes and seven appendices make up well over half its 685 pages). An LDS friend told me, "orthodox Mormons don't like this book, but I don't hear any of them saying it isn't credible." Central to the power and credibility of Quinn's massive synthesis — and a riveting story in itself2 — is the unprecedented access he enjoyed to the LDS Church's archives over a fifteen year period. In delivering up the results of this research Quinn withholds judgment on the claimed supernatural experiences of Joseph Smith and other Mormon leaders, and lets their observed actions speak for themselves. Mormonism has been described as "faith cast as history." This aptly describes the LDS church's claim that it was founded after Joseph Smith received two levels of priesthood directly from heavenly messengers in 1829 (the Aaronic, or lower priesthood from John the Baptist, and the Melchizedek, or higher priesthood, from Peter, James, and John ). This authority is said to have been previously lost since the days of Jesus' apostles. Since only the LDS church has this restored priesthood authority, it is the one true church. However, as Quinn details meticulously in his opening chapter, the diaries and records of Joseph Smith and other Mormon leaders show that there was no claim to an angelic restoration of authority until 1834. In fact, Mormon priesthood concepts evolved over a period of several years, and the accounts of ordination by heavenly messengers were then written back into Mormon scripture retrospectively (pp. 18-19). Of the higher priesthood in particular, Quinn concludes, "when retroactive changes are eliminated from original documents, evidence shows that the second angelic restoration of apostolic authority could not have occurred before the church's organization on April 6, 1830" (18). Mormon historians have tended to avoid this evidence because it means the church was organized without proper priesthood authority (26). This evidence will be haunting for thoughtful Mormons who take official church teaching seriously. Most illuminating, however, are chapters three and four which show the logical relationship between Joseph Smith's unique authority claims, his increasing sense of "ethical independence" from civil government, his "enshrine[ment] of secrecy" (191), and ultimately, establishment of a functioning theocratic state in Nauvoo, Illinois with himself ordained as king and lawgiver. In 1835 the Mormon Prophet announced a doctrine Quinn calls "theocratic ethics." He used this initially to "justify his violation of Ohio's marriage laws by performing a marriage for Newel Knight and the undivorced Lydia Goldthwaite without legal authority to do so" (88). Joseph declared, "I have done it by the authority of the holy Priesthood and the Gentile law has no power to call me to an account for it" (88). This was followed by other illegal marriages of undivorced legal spouses, resulting in bigamous, polygamous and polyandrous marriages, and Smith's own secret sexual relationships with polygamous wives as young as fourteen (89). The theocratic nature of nineteenth century Mormonism was responsible for much of the conflict and persecution that dogged it, according to Quinn. Mormons were centered largely in a succession of socially cohesive communities first in Kirtland, Ohio, then in Nauvoo, Illinois, and finally the Utah territory. This communal nature was closely related to the group's authority claims: to accept Joseph Smith's religious authority was "to accept a social, political, economic, and cultural system" (79). The history of Mormonism in this period was one of frequent conflict and persecution, often violent. Out of this conflict grew an indelible world view of Mormonism as the object of religious persecution. However, Mormons were often the perpetrators as well as the victims of intimidation, says Quinn (92,100). "Fear of being overwhelmed politically, socially, culturally, economically by Mormon immigration was what fueled anti-Mormonism wherever the Latter-day Saints settled during Joseph Smith's lifetime. Religious belief, as non-Mormons understood it, had little to do with anti-Mormonism. On the other hand, by the mid-1830s Mormons embraced a religion that shaped their politics, economics, and society. Conflict was inevitable" (91). Joseph Smith's vision of the Kingdom of God on earth reached its climax in Nauvoo, Illinois where the Mormons re-grouped in 1840. A charter granted by the state legislature allowed the Mormon prophet to serve as mayor, chief justice of the municipal court, and commander of his own militia. By 1844 Nauvoo was the second most populous city in Illinois and virtually every post in its civil government was filled by a member of the Mormon religious hierarchy, making it "the first ministerial theocracy in American history" (106). The Nauvoo Legion had nearly 3,000 troops, at a time when there were only 8,500 soldiers in the entire U.S. army. "Nauvoo had the appearance of Smith's personal theocracy" (110). But beneath the surface of Nauvoo was a polygamous underground known only to select members of the Mormon hierarchy, hand-picked by the prophet. In 1842 he used Freemasonry to establish an "Anointed Quorum." Sworn to secrecy, they were introduced to "the principle:" polygamy as the divinely revealed path to exaltation in eternity. Then in the spring of 1844, just three months before his death, Smith formed the ultra-secret "Council of Fifty" which he had ordain him "King, Priest, and Ruler over Israel on Earth" (128). Quinn estimates that 90-95 percent of Mormons at the time knew nothing of the secret things of Mormonism (170). But Smith was cautiously moving to show his hand to the uninitiated. A March 15, 1844 editorial in the LDS Times and Seasons newspaper under the headline "Religion and Politics" criticized separation of church and state; it concluded that, "the church must not triumph over the state, but actually swallow it up" (122). However, Smith had overstepped himself. Some members of the Council of Fifty already uneasy about polygamy, "regarded Smith's kingly ordination as treasonous" (137), and betrayed him. His declaration in a May 12, 1844 public sermon that, "I calculate to be one of the instruments of setting up the Kingdom of Daniel by the word of the Lord, and I intend to lay a foundation to revolutionize the world" (137) provoked an immediate and strong negative reaction within the Mormon community. A dissident Mormon newspaper was formed — the Nauvoo Expositor — for the purpose of exposing Smith's secret promotion of polygamy and the attempt to make himself theocratic king and lawgiver. Smith immediately ordered the press and papers destroyed. Within days the Mormon prophet was arrested for these actions and brutally murdered by a mob that stormed the jail where he was awaiting trial. Quinn leaves it to readers to decide the lessons of this disturbing saga. Surely one lesson is that if Joseph Smith's opponents had allowed the judicial process to work its course (as Romans 13 dictates), both the prophet and his religious experiment would have been effectively exposed 150 years ago (many high-ranking Mormon leaders were prepared to testify against him). Instead the movement was re-energized by his martyrdom. Mormon readers will have to decide whether their faith can survive with no genuine historical foundations for the restoration of priesthood authority. They will also have be forced to come to grips with the inextricable role of secrecy and dishonesty in Mormon origins. In stark contrast, Jesus could confidently declare at his trial before the Sanhedrin, "I spake openly to the world; I ever taught in the synagogue, and the temple, whither the Jews always resort; and in secret have I said nothing" (John 18:20). This book shines the powerful light of truth on dark areas of Mormonism's past. 1. See his fascinating autobiographical essay, "The Rest Is History," in Sunstone (December 1995), pp. 50-57. 2. Ibid. Quinn implies divine providence made possible his extensive access to LDS church archives.